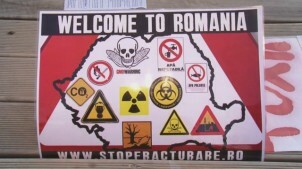 Environmentalism is a relatively new phenomenon in post-communist countries such as Romania. But mobilizations over gold mining and fracking in the country has shown that communities are willing to take to the streets en masse to defind their rights to environmental health. A recent decision of the Parlianment against amending the mining law to help facilitate a mega-gold mine operation gives hope for the nascent EJ movement growing in Romania, but at the same time repression against fracking still gives cause for concern. Hundreds of thousands of citizens throughout Romania have been fighting the government since 1989 on gold mining in the Rosia Montana region. Mining in Rosia Montana would not only decapitate mountains, pollute water, and fill the region with cyanide waste, but it would also destroy a 2,000 year old historic area set to be preserved as a UNESCO site. The impacts of mining are eloquently described in EJOLT’s previous article Stopping Romania’s mad gold rush. Fortunately, and miraculously, on the 10th of December Romania’s lower house of parliament rejected revisions to the general mining legislation that would have enabled Canada’s Gabriel Resources to proceed with plans to build Europe’s largest open cast gold mine. The decision was particularly welcomed because it was unexpected: because corporations are heavily intertwined with Romanian legislation, it was assumed by many that the parliament would vote in favor of the bill. This is a huge victory for Romanians—for their civil rights, the health of their people and environment, and to reward 24 years of grueling protest against this mega-mining project. The parliament’s decision to reject pro-mining legislation is an incredibly important reason to celebrate, for civil rights and because it sets an important precedent against destructive industrial projects. The same government’s response to the anti-fracking campaign, on the other hand, is progressing in mostly frightening ways. Locals in proposed fracking areas have been building an anti-fracking movement over the past year, with protests escalating considerably in the past four months. From the start, Chevron and its constituents (including political officials) have been conducting business with corrupt, shady methods. When Chevron first approached locals to interview them and gather support for fracking, they asked ambiguous questions like, “Do you agree with natural resource extraction?” Many answered yes, which resulted in inaccurate and skewed public surveying. Similarly and more recently, Chevron purportedly sent out “fake journalists,” who were protected and defended by police, to collect signatures to register for “free newspaper subscriptions,” but community members were actually signing a pro-fracking petition. Force, intimidation, and lies are being used to control citizens, including fines for protesting, unwarranted detainment, threats to take adopted children from their families, and firing local councilors who oppose fracking. A permanent anti-fracking camp in Pungesti was set up four months ago to actively and continuously demonstrate against Chevron. The conflict has been mounting over the past week in particular, after the government imposed a military-style blockade in Pungesti where they blocked the roads and isolated villagers, not even allowing children to attend school in the nearby village. On the 6th of December, villagers and activists from the Pungesti camp broke the fences surrounding 22,000 acres of wide terrain, where Chevron is starting to explore for shale gas. The 500 Romanians outnumbered the 400 riot police and managed to stop Chevron’s exploration activities for the day. Once night fell, riot police violently sieged the camp, destroying tents and claiming that the camp was “filthy” and needed to be cleaned, as was done in New York as an excuse to clear the Occupy Wall Street protests. Riot police stormed houses, beating people, and detaining them at the police station for “illegally” allowing activists to sleep in their houses. The situation has spun out of control because citizens have no protection and are in a downhill battle for their civil rights. Locals claim that Romania is “like a war-zone” with the unjust police actions, swelling fear, and government dedication to corporate interests rather than the protection of its people’s rights and welfare. Currently, Chevron claims to be searching for conventional gas and refuses to discuss fracking due to the continued public expression of outrage. Romanians feel that Chevron is trying to fool them and by all means take advantage of their resources and livelihoods. The government is consumed by the possibility of potential economic benefits—at the cost of its citizens. Chevron’s insistence is one piece of the problem, while the Romanian government’s allegiances and treatment of its people are other troubling pieces that have resulted in a nation on the brink of deterioration of civil rights. Amongst the despair in the anti-fracking campaign, there is a glimmer of hope. There were 14 communities that filed claims against their local governments, and one of them reached a very important and helpful decision. The local court established two conclusions: 1) Local Council Vlahos had administrative-territorial jurisdiction to issue a decision that prohibited development and exploitation of shale gas and has not exceeded the powers invested in local government; and 2) “National interest,” as claimed by Chevron proponents, does not include shale gas. The Petroleum Law makes no mention of shale gas being declared a national interest. Under these circumstances, local governments have every right, especially under the primary responsibility of protecting the environment, to vote to ban shale gas exploration and exploitation. This court decision is of utmost importance because it generalizes the principle of local autonomy and develops a precedent to allow local control of shale gas reserves. The fracking revolution is spreading, quickly. Some headlines in the Financial Times over the last six weeks are: “Japan wakes up to US shale revolution;” “Mexico awaits its own shale revolution;” and “Russia is gearing up for an oil boom on the same scale as the US.” Poland has experienced a comparable anti-fracking movement as Romania and is taking even more severe procedures to control the public protest. Poland is poised to outlaw anti-fracking dissent with new proposed legislation, which campaigners claim would “effectively eliminate the possibility of organised opposition.” This is happening in a country where campaigners say they are already operating in a “climate of fear.” This legislation would be a gross violation of human rights and must be stopped. The global environmental justice battles are constant struggles for human and environmental rights. Diligent public participation is necessary to keep the govenrment in line, and even then, governments often overpower their citizens with unjust measures. Though the war on fracking is still raging in Romania and throughout the world, decisions that benefit the welfare of locals and the environment offer a glimmer of hope. This is why the Rosia Montana victory in Romania is no small feat; after over two decades of dedicated public protesting, this ruling sets a precedent by which cases in the future, in Romania or elsewhere, may be modeled. *See EJOLT report 6, chapter 3 for more information on fracking. *See EJOLT report 7 to learn about global mining conflicts. *For more information about the mining legislation decision in Romania click here. *Video on the protests in Pungesti is available here. *For more details about the global spread of fracking click here.